The number of VOCs in indoor air is also long – the U.S. Environmental Protection Agency enumerated more than 900 in a 1989 Report to Congress. While some pose no known danger to health, others are linked to acute and chronic health effects like asthma, impaired lung function, or damage to liver and kidneys. Mixtures of VOCs are generally thought to be the cause of Sick Building Syndrome in which sensitive individuals experience symptoms of headache, nausea, and/or eye, nose & throat irritation in specific indoor settings. Some VOCs are even known to be carcinogenic, like benzene in tobacco smoke, perchloroethylene (aka “perc”) in dry-cleaning fluid, methylene chloride in paint strippers, and formaldehyde in pressed wood products like particleboard. That indoor air concentrations of VOCs can reach unhealthy levels was highlighted in 2008 when formaldehyde fumes sparked the recall of more than 35,000 trailer homes that had been provided to victims of hurricane Katrina by the Federal Emergency Management Agency. Perhaps even more disquieting than the stealth-like nature of VOCs, many of which are odorless, is their potential to react chemically with one other to produce other potentially unsafe compounds. A 2006 report commissioned by the California Air Resource Board, for example, outlined how compounds called terpenes, used in air fresheners and household cleaning agents because of their pleasant odor and solvent capabilities react with ozone to produce formaldehyde along with various particulate pollutants. According to the Environmental Protection Agency, about a dozen common VOCs are consistently found at two to five times higher levels inside homes than out, even in rural settings. Certain activities, like paint stripping, can elevate VOCs by a factor of 1,000. When you add in unpredictable chemical reactions among VOCs, it’s enough to make breathing indoors seem a bit of a crap shoot. Australian researchers headed by Dr. Margaret Burchett at the University of Technology have since revealed fascinating twists on the potted plant story. First, the plants per se don’t get all the credit since the potting mix microbes living synergistically with the root system do the actual work of removing the pollutants. Soil microorganisms are able to biodegdrade the VOCs by using them as a food and energy source. The plants’ job, in turn, is to nourish the root-zone microbial community. Second, soil microbes exhibit smarts in that, with repeated exposure to a given VOC, they‘re able to remove it from air more quickly. The microbes are thus ever adapting to the VOCs they encounter. 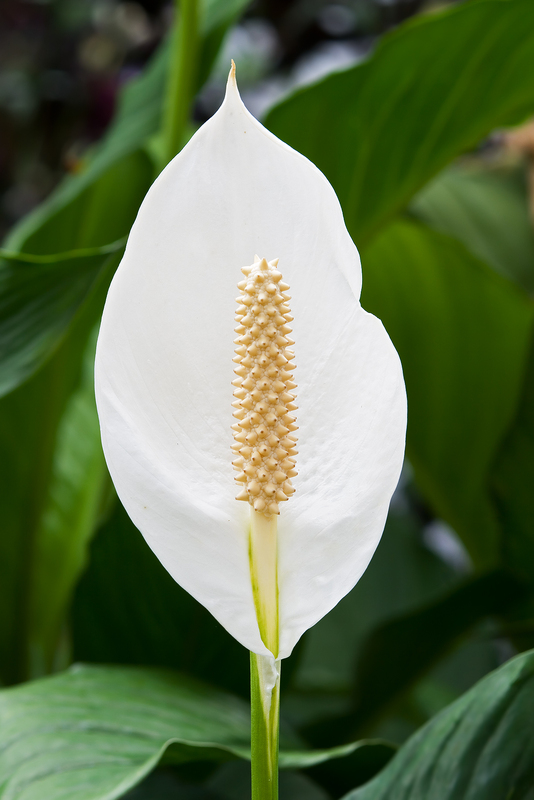 Burchett has demonstrated the efficacy of common houseplants, like the peace lily or dracaena ‘Janet Craig,’ in real life settings with or without air conditioning. In single occupancy-sized offices, 3-6 plants kept the total load of all VOCs to below 100 ppb, the equivalent of “very clean air.” The plants even proved adept at removing highly toxic carbon monoxide. Dr. Wolverton is also recently promoting hydrocultured interior plants which he claims increase air purification by 30-50% over plants in soil. His soon-to-be-published book on the topic explains how inert pebbles that replace the potting soil give better results and also take the guesswork out of maintaining optimal soil moisture. That plants really do create a healthier indoor environment is supported by studies reporting significantly fewer worker complaints, such as coughing and fatigue, in offices adorned with plants. Indoor air polluted by VOCs is but an example of the myriad of environmental ills created by the technology that has come to define westernized living. As such, the kneejerk reaction is to reach for a technological solution like electric air filtration. The potted plant stands in sharp contrast and as an awe-inspiring testament to the complexity and infinite wisdom of nature. The VOCs – potted plant saga embodies two important messages: The wanton creation of synthetic consumer products is not without health risks, and man’s survival on earth surely depends on his willingness to live within the embrace of Mother Nature. This entry was posted on Friday, August 28th, 2009 at 4:00 pm and is filed under energy, global warming, health, pollution, science, sustainable living, toxics. You can follow any responses to this entry through the RSS 2.0 feed. You can leave a response, or trackback from your own site. Will any sort of potted plant work or are there some that are better than others? Hi Eric – nice to hear form you. You did not read far enough into the article – it lists the NASA scientist’s top 10 plants, although dozens and dozens have been tested and will do the job with varying levels of efficiency depending on the specific air pollutants that are being targested. There is a link in the article to Dr. Wolverton’s organization for more information. Dusty – Nothing about mold in air emanating from potted plants turned up in my research. Doesn’t mean it’s not true. Comments are welcome from anyone with real data in hand. I interviewed BC Wolverton last fall about his new book and he recognizes mold can be a problem, as does Canada Mortgage and Housing Corporation (cmhc.ca). Avoid overwatering and clay pebbles instead of soil solves the problem and others as well. One thing I never read in articles on the topic is that opening windows or using a heat recovery ventilator (HRV) – a must in cold climates – cleans air more effectively as does putting dozens of plants in your home. So while they have many physical (negative ionization, etc.) and psychological benefits, don’t rely on them for clean air. Start by removing and minimizing sources of pollution, build tight and ventilate right. Only in polluted cities (and outer space) such as New Delhi does BC recommend building super tight, avoiding fresh air intakes and loading buildings with plants.